Oil States’ Diverless Clamp Connectors deliver economical, reliable ROV-assisted pipeline and flowline connections from 4” to 24” and up to 15,000 psi working pressure. Articulated and inline versions are available for customer-specific applications. The Remote Articulated Connector (RAC) accommodates up to 5 degrees axial misalignment between the male and female hubs, virtually eliminating stresses caused by the original misalignment. The Remote Inline Connector (RIC) is an inline system typically used in flexible jumper and flowline connection for a quick, reliable connection where misalignment is not a significant issue. The Diverless Clamp Connector utilizes proven deepwater connection technology with metal-to-metal seals, quick installation and testing via ROV, high bending and torsional capacity and a compact, lightweight running tool. Articulated design available to accommodate up to 5 degrees misalignment. 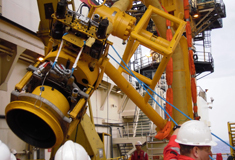 Fast, reliable installation and testing via ROV. Metal-to-metal sealing with reversible operation. High bending and torsional capacity.